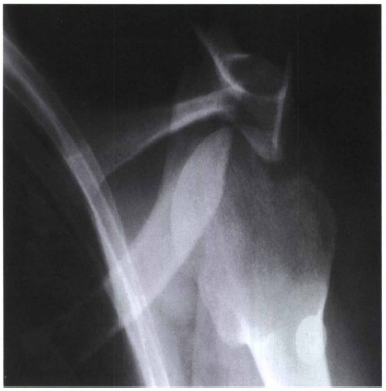 An optimal trauma projection for possible scapulohumeral dislocations (especially posterior dislocation), glenoid fractures, Hill-Sachs lesions, and soft tissue calcifications. Center scapulohumeral joint to CR and mid-IR. Adjust IR so that the 45 degree angled CR will project the scapulohumeral joint to the center of the IR. 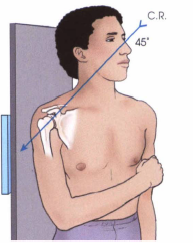 Flex elbow and place arm across chest, or with trauma, place arm at side as is. CR 45 degree caudad, centered to the scapulohumeral joint. Collimate closely to area of interest. The humeral head, glenoid cavity, and neck and head of the scapula are well demonstrated free of superimposition. The coracoid process is projected over part of the humeral head, which appears elongated. The acromion and AC joint are projected superior to the humeral head. CR and center of collimation field should be at the scapulohumeral joint. Optimal density and contrast with no motion will demonstrate clear, sharp bony trabecular markings and soft tissue detail for possible calcifications.